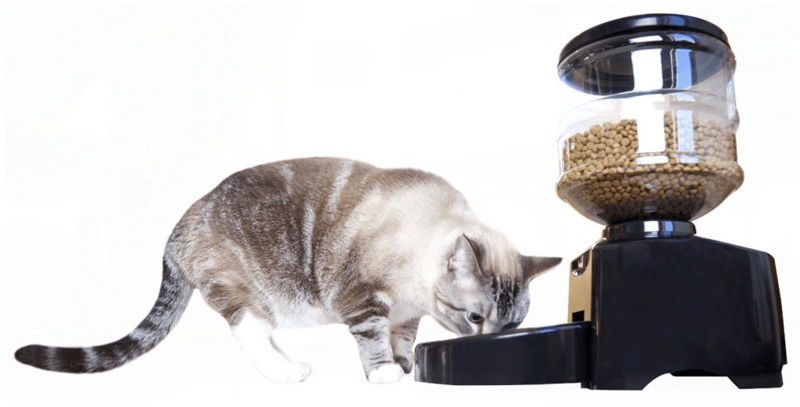 Despite the fact that so many automatic cat feeders might seem like the same product, there are some that truly stand out against the others. MOTA has done a lot of work to get the formula right, which shows when you take a look at this model from them. This cat feeder can hold an incredible amount of food, is easy to program, and it remains strong after years of use. There are almost too many good things to say, although there are a few things that are worth pointing out. These are the highlights, but it is well worth a second look if you have passed up on it before. Let’s dive right in and take a look at what it has to offer you as a cat owner. The Perfect Dinner Pet Feeder lets you keep a close eye on the kinds of meals that your cats are eating. Keeping cats on a diet plan is never an easy task, although having the right portions in place makes it a little easier. For each meal, this feeder will dispense anywhere from 1/4 cup of food on up to 1.5 cups. This is important if you have strict dietary portions set by your veterinarian. This automated feeder allows you to fill it and forget it. You should, of course, always keep an eye on whether or not your cats are eating, but you can fill the hopper with an entire bag of food so that you never have to worry about refilling the food. Around 7 pounds is the average that can fill it, which fits with most standard sized bags of cat food. It doesn’t take much time at all to set up the timer and start feeding your cat on a schedule. 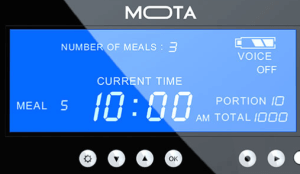 The large LCD screen displays not only the time, but the meals that you have programmed, including the size and the number served. You can quickly input different feedings depending on the size of your cat. Cats can be stubborn. Sometimes you have to actually tell your cat that it is time to eat, which is why the feeder rings a bell each time that there is food ready for it. You can even record your own voice telling your cat that they are about to eat, which can go a long way with your cat and help you feel like you aren’t ignoring your cat by letting a machine take care of the feeding. You aren’t going to have to break the bank in order to start feeding your cat on a schedule. 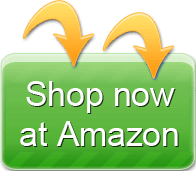 Rather than paying $200+ dollars, like you will with many feeders on the market, you will only have to pay around $60. That is a tiny price to pay for the peace of mind of not having to physically keep your cat on track with their diet. Truth be told, there are a few drawbacks that some people have found, although they shouldn’t be issues for most people. Larger cats might be able to find a way to tip over the feeder and get to the food inside. It can be top heavy when it is filled to the top, but unless you have an 18 pound pet, you shouldn’t ever have this kind of problem. The timer and scheduler on this feeder can only handle up to three feedings a day. If you have a special case that requires you to feed more than that, this won’t be the ideal feeder, but most cats can be happy campers on just three meals a day. 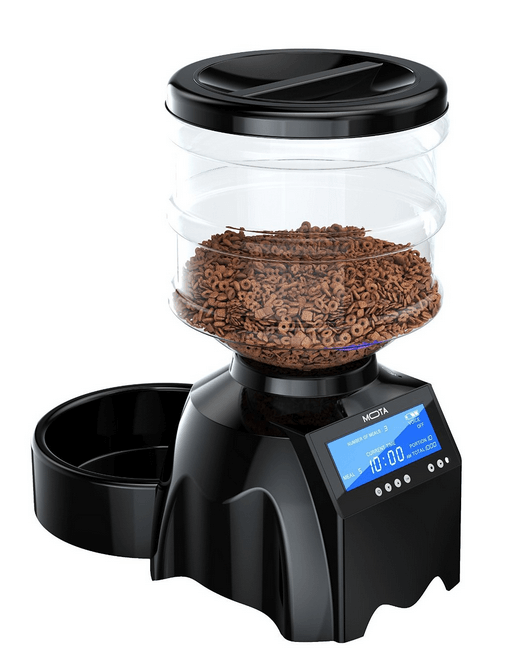 The smallest that this can dispense at a time is 1/4 cup, which is larger than many others. This isn’t ideal for people who have very small cats that require many feedings throughout the day. The timer can be scheduled to dispense food up to three times a day. It can hold around 5-7 pounds of dry food, making it easy to fill and not worry about for up to a week or more, depending on how much your cat eats each day. This automated feeder is only powered by batteries, although a pair of batteries can last for several months without having to be changed. The automated cat feeder only makes noise when it is dropping food, although not much. It is just enough to alert the cat that food is on the way. 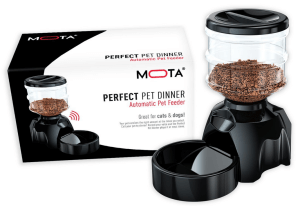 The Perfect Dinner Pet Feeder is surprisingly affordable despite everything that it has to offer you as a cat owner. The ease of use alone should be a great indicator of what it can do for you, but as you can see by now there is so much more. It might not be the fanciest automatic cat feeder on the market, but that doesn’t mean it isn’t excellent.